University Park, Pa. — Lisa Iulo, associate professor of architecture and director of the Hamer Center for Community Design in the Stuckeman School at Penn State, is the lead researcher on an interdisciplinary team that has received funding from Penn State to develop community-based solutions to river flooding in Pennsylvania under the University’s strategic plan seed grant program. The proposal, titled “Penn State Initiative for Resilient Communities (PSIRC): A Pilot to Develop Community-Based Solutions to Riverine Flooding,” is one of nine that received University funding as part of the third round of seed grants for strategic initiative pilot programs this semester. Since last year, Penn State has invested more than $4 million in over 20 pilot programs, while simultaneously advancing the vital and transformative work of its faculty, staff and students. Lara Fowler, senior lecturer in Penn State Law; Klaus Keller, professor in the Department of Geosciences; Robert Nicholas, associate research professor with the Earth and Environmental Systems Institute; Nancy Tuana, DuPont/Class of 1949 Professor of Philosophy in the College of the Liberal Arts; and Homer “Skip” Wieder, chair of the Susquehanna River Heartland Coalition for Environmental Studies, are co-principal investigators on the project. Iulo and her team have established a network of collaborators — scholars, practitioners and community members — to assist on the project, including experts in flood modeling and policy, as well as representatives from Penn State’s Sustainability Institute, the Lewisburg (Pennsylvania) Neighborhoods Corporation, the Lycoming County Government Planning and Community Development Department, Pennsylvania Floodplain Managers Association, and the SEDA Council of Governments. A strong partnership has been forged in Selinsgrove, Pennsylvania, as a pilot for this initiative. During initial discussions, it became evident that Selinsgrove is indicative of challenges faced by many of Pennsylvania’s riverine communities, thus it was designated as a pilot, where lessons learned can inform other communities throughout the Susquehanna River Basin. A significant component of PSIRC is to broadly engage with stakeholders and decision-makers about flood resilience in the state’s riverine communities. There are more than 70 historically and culturally significant urban centers and rural communities along the Susquehanna River that are facing increased risk of floods, which result in economic, environmental and social stresses — threats that disproportionately affect low-income households. PSIRC is synergistic with another Stuckeman School effort supported by a Penn State strategic plan seed grant, the Ecology + Design (E+D) initiative, which is led by Andy Cole, associate professor of landscape architecture and ecology. This spring, a landscape architecture course taught by Stephen Mainzer, assistant teaching professor, has taken on the project in Selinsgrove with the support of the Hamer Center and E+D. The students in Mainzer’s class are looking at a socio-ecological systems approach to balancing flood attenuation techniques with the town’s economic resources through a series of linked urban development projects. Selinsgrove residents experience the same issues as other communities along the Susquehanna: poor economic development, stormwater and flooding issues, traffic and pedestrian patterns, and housing and land utilization. An important part of the Selinsgrove community also is the interaction between nearby Susquehanna University, the downtown area and access to the Susquehanna River. 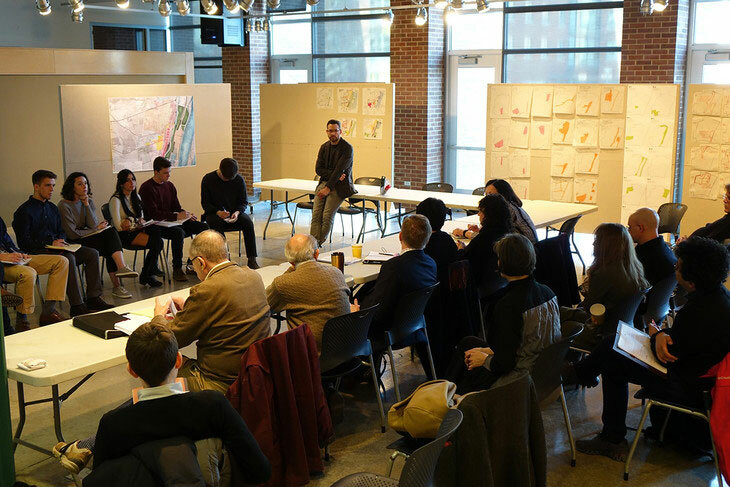 The class presented initial analysis and design visions to members of the Selinsgrove community on Feb. 28 to get feedback before they adjust and finalize their designs. Students will exhibit their final projects for the Selinsgrove public on May 1. In the long term, the goal of the PSIRC project is to establish collaborations with colleges and universities across Pennsylvania to help build and strengthen relationships with their local communities through the state’s shared common research interests of water, energy and land resources.